Guam House Finder has hundreds of Guam homes for rent including houses, condos, apartments, and townhomes in popular neighborhoods. Whatever you are looking for, we have most if not all the homes available on the Guam real estate market, right here on our easy to use website. If you can’t find what you are looking for, just contact us, and we’d be more than happy to help you search for Guam homes for rent that meets your needs. With so many options of Guam homes for rent, it may be a bit overwhelming to go see every home you are interested in. Driving around and looking for a place could be time a bit time consuming. 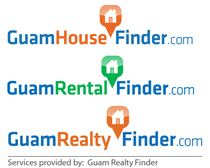 Why not “pre filter” the potential homes for rent right here at Guam House Finder where you could view, filter, and save your potential Guam homes for rent. A good place to start your search for Guam homes for rent is to decide where you want to live. Deciding where to live usually depends on your lifestyle needs. The usual options for a place to live is a place near work or a place near the action(Tumon & Tamuning). Filtering your search based on the location and your budget should get you started in the right direction. Options for Guam homes for rent are bountiful with hundreds of options to choose from. At Guam House Finder, you can find ocean view homes, beachfront homes, homes in a golf resort, homes near the action, homes in a family friend neighborhood, and homes in a nice quiet neighborhood. Living in a tropical island, you may want to consider a rental on the ocean or an ocean view. If you are looking for Guam homes for rent with an ocean view or beach front, you may be limited to a condo or apartment. Houses on Guam with an ocean view or beach front are not bountiful, and may be quite pricey at times. Many beachfront and ocean view condos and apartments are available in the Tumon and Tamuning areas along the coast of Tumon Bay and Agana Bay. Being in a tropical island, another great option for Guam homes for rent may be a place on a golf resort. Guam offers a couple of world class golf courses designed by PGA professional golfers. Some of the golf resorts offer condo style homes and also villa style homes for rent right on the golf course. The golf resorts that offer condos and villas do offer many amenities such as gyms, bowling, restaurants, stores, security and of course golf. Living in a golf resort offers many amenities not just for golfers but for everyone looking for a quiet peaceful residence with great amenities. Whether you are looking for a place on the beach or on a golf resort, Guam offers many options for Guam homes for rent. In the rare case that you don’t find what you are looking for on our website, feel free to let us know and we can look into finding Guam homes for rent that meet your needs better.